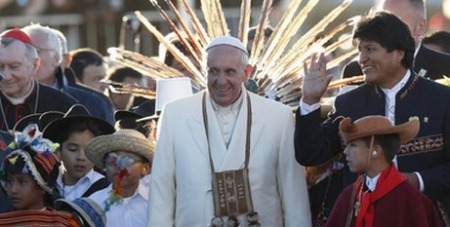 Pope Francis has called on a million faithful to reject today's consumer society at an open-air Mass in Bolivia. He also advocated for the poor, saying "that no one has to be discarded." On the second stop of his three-nation tour of South America, the Pope yesterday addressed the throng in the vast Christ the Redeemer Plaza in Santa Cruz, including many people who camped out overnight to see him. He denounced what he called a "mentality in which everything has a price, everything can be bought, everything is negotiable. This way of thinking has room only for a select few." "Jesus speaks these words to us, here in this square. No one has to be discarded," the 78-year-old Pontiff told the crowd, estimated by Bolivian authorities at one million strong. Society cannot ignore people, the Pope said, "no matter how little they possess or seem capable of contributing." The two-hour service featured religious hymns and chants. Hundreds of musicians also played Baroque works, introduced by Spanish Jesuit missionaries in the 18th century and still very popular in this country. Thousands in the crowd were from Bolivia's indigenous majority: Quechua, Guarani and Aymara Indians. President Evo Morales, the country's first indigenous leader, was in the front row.